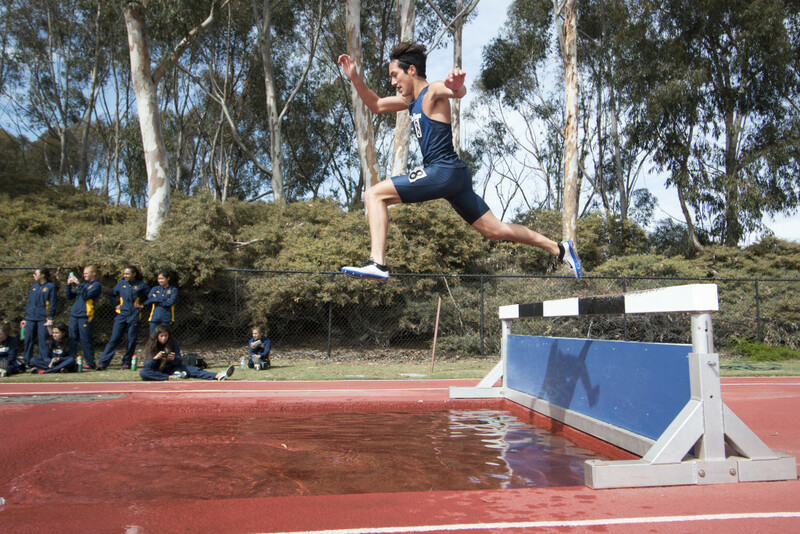 Over this past weekend, the UCSD men’s and women’s track and field teams hosted the Triton Invitational at the Triton Track and Field Stadium. The two-day Triton Invitational, taking place on Friday and Saturday, boasted over 1,500 competitors including a few Olympians and Olympic hopefuls. Among these competitors were American Olympian Jeneba Tarmoh, reigning Olympic long jumper Greg Rutherford and 2015 World Champion in shot put Joe Kovacs. On Friday, six Tritons participated in various events with the competition starting at 9:30 a.m. Junior Chrissi Carr represented the women’s team in the pole vault event, in which she tied for 11th with a clearance of 11’5.75”. Teammate sophomore Devin Stetson was also able to clear the 11’5.75” height, but she was placed lower at 16th due to more attempts being taken. In the hammer throw competition, junior Savanna Forry placed 39th with a distance of 147’9”. In the discus competition freshman Esther Nofodji took 31st with a distance of 139’6” and teammate sophomore Hannah Johnson took 44th with a distance of 127’6”. On the following day, the men’s 4×100 relay team won the race competition with a time of 41.35, with freshman Andrew Dirks, sophomores Justin Hunter and Paul Doan, and junior Emmanuel Elijah, made up the award-winning formula. Doan had an impressive meet as he also placed first among collegiate athlete competition for the 100m with a time of 10.68, which was 10th overall in the competition. Doan also competed in the 200m in which he finished with a 21.48 time, allowing him to qualify for provisionals with the 12th overall time. Teammate sophomore Nick Famolaro also grabbed a provisional qualifier with a personal best recorded at 1:52.31 in the 800m competition, earning him eighth place. For the women’s 800m, teammates sophomore Kristin Semancsin and junior Ella Verhees were also able to record their personal best run times of 2:17.20 and 2:17.34, respectively. During the women’s high jump, Forry won sixth in the invitational section for clearing 5’5”. Teammate freshman Natalie Caraway also cleared the 5’5” mark to win the open section. For the men’s triple jump, sophomore Matt Bowen won with a distance of 48’3.25” while on the women’s side, seniors Kristin Sato, Kristen Daugherty, Ashley Rhorer, and Caraway won fifth to eighth place with distances of 37’7.25”, 37’6.75”, 37’1”, and 37’0.5”, respectively. As for the women’s 400m hurdles, freshman Kelly Strand and sophomore Meghan Fletcher took home seventh and eighth place but narrowly missed the provisional mark of 1:02.40. Redshirt senior Ellexi Snover was able to finish ninth in the women’s javelin throw with a throw of 132’3” while teammate senior Haley Libuit finished 14th with a throw of 125’11”. For the men’s javelin throw, redshirt senior Anthony Capitulo and senior Travis Vandegriff threw distances of 205’11” and 199’4” to take home eighth and 10th, respectively. After hosting such a popular invitational, the Tritons will be heading to the CCAA Championships in two weeks which will be hosted by Cal State Los Angeles.